K: I went to see Chelsea with a bunch of girlfriends and we had a great night. She had little treats and champagne there for us to snack on and made the whole experience feel very personal and easy. B: I knew I was planning on proposing to Kelly in July and I had an idea I wanted to use Honey Designs. So, I met with Chelsea in May and I fell in love with a diamond and purchased it that day. It all seemed too easy, so my OCD personality came out the next day and I was overwhelmed with anxiety thinking I should have looked around more. So, I called Chelsea and made her life a living hell for the following weeks haha. She was such a trooper and even talked me through my forensic work (visiting other jewelers) just to make sure I picked the right diamond and setting. 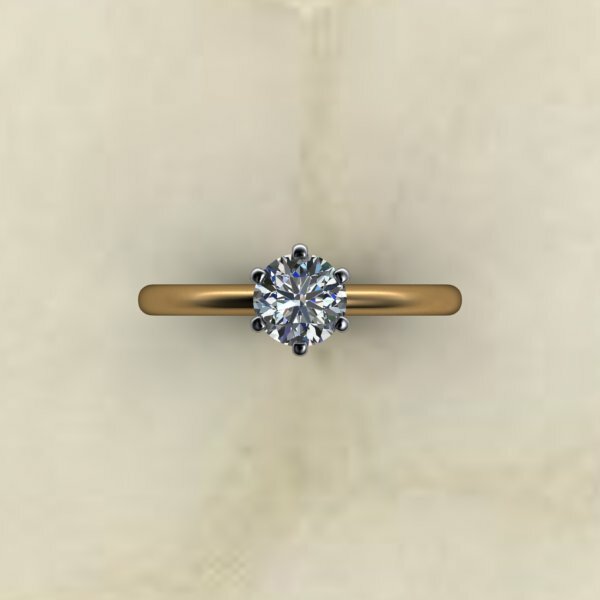 I totally botched up the process of doing research before buying the ring, but ultimately Chelsea and I came up with a simple design that Kelly is absolutely in love with. Chelsea was more of a consultant which sets her apart from her competition. . . We went through multiple design stages before choosing the perfect setting and she was able to walk me through the entire process (which is a process guys are very unfamiliar with BTW). I am very happy I chose Honey Designs and I highly recommend her to anyone! Selling an engagement ring isn't just a transaction to Chelsea it is so much more than that to her. K: It’s hard to say as the person who received the ring, but I know that Chelsea is someone we trust. There are so many ring vendors out there who know more about the business and diamonds, more than you, so having someone who has your best interests at heart is very comforting. B: I wanted a custom made ring that would make my GF/ Fiancee know that I put thought into it, I wanted the ring to be beautiful and one of a kind just like Kelly. K: Chelsea walked me through the whole engagement process! She thought of things I didn’t even think of. I also didn’t know a whole lot about jewelry! B: How creating such a simple ring could be so stressful, I knew exactly what Kelly wanted but I insisted on adding my own personal touch (which made the process take longer than expected). K: I love how it’s one-of-a-kind and my fiance took so much time creating it. B: Seeing Kelly's face when I dropped down on my knee and those moments when I see her looking at her hand and smiling. I just love how much she loves it. K: We were at a pre-game party about to go out. Billy was at a pool all day, still in his swim trunks and I showed up with wet hair and an outdated romper. B: We met through mutual friends at a house party in May of 2014, we had an instant connection, we dominated at beer pong, went to MLT's, had late night sushi at Cloud Nine, and slept on a blanket on her front lawn. The following day we went cabrewing with friends and she was able to witness my clumsiness and my habit of making weird noises. We have been dating ever since. K: M Woodfire Grill! It is out of business now, (replaced by Forno). Then we bought a pint of ice cream and watched Frozen. It was a perfect night! B: If you aren't counting Cloud Nine, our first date was the following week at a place called M and we shared a tiny pizza (if I would redo it I would have ordered much more food because Kelly is an eater!) haha , M is now shut down (I hope that isn't bad luck). K: I can’t say! There are too many cool spots. I love the river and the gardens in Eden Park. I feel like I’m still discovering places myself! B: Kelly and I love being outside and enjoying nature, we honestly love the parks in Cincinnati. We frequent Alms and Alt Park, but love other places like Washington Park, the Cincinnati Nature Preserve, and Sharon Woods. B: Sharon Nursery, my grandpa and his best friend started the nursery out of high school and now my dad helps run it. If you want to landscape your home or buy flowers, there isn't a better place to go in the city. It's beautiful and has people who have worked there for a lifetime, so they actually know what they are talking about. I also love Elis BBQ, Arnolds, The Eagle, Ruth Thai, and Cloud Nine Sushi. K: I love when Billy and I pack our picnic basket and go for a picnic at Alms Park (our wedding reception location! ), or when we decide to go Downtown for the day and explore the shops while we bounce around. 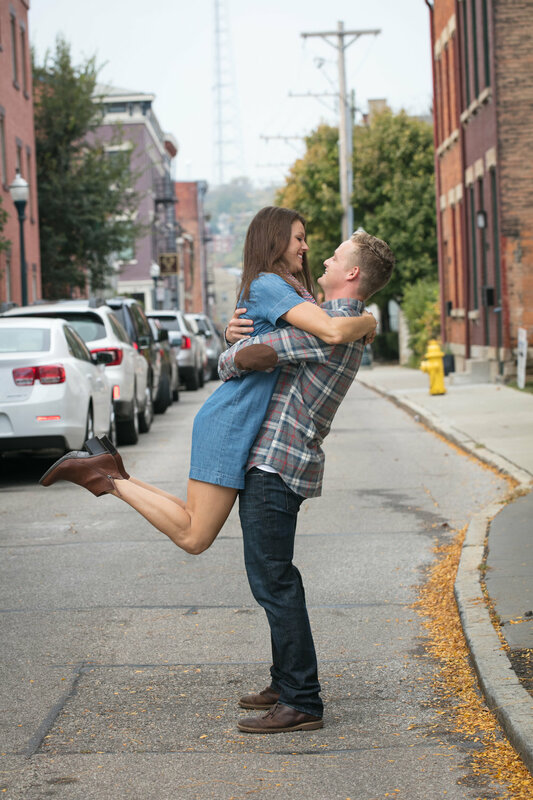 B: Our favorite day date would be going to Findlay Market to get food and finding a cool spot at one of the Cincinnati Parks for a picnic. Our favorite date night usually involves a good burger, beer, live music, and ice cream. Our favorite spot is Arnold's for some live music and good food, topped off with some Graeters afterwards.